When I began growing vegetables and herbs on the balcony of a condo in 2007, it was a new way of maintaining some activities I’d loved all my life: be outdoors, get grubby, and experiment. Soon after the gardening thing took hold of me I had a daughter, and when I wasn’t getting to know this new human being or sacked out, exhausted, I was reading about gardening, blogging about it, dreaming up weird growing contraptions. I’m an inconsistent gardener at best, but growing and cooking from the garden is a mainstay of my life, and one of the most rewarding things I do. Since the condo, I’ve moved from having plots in two beautiful community gardens to my own half-acre yard with a slowly increasing number of garden beds. It’s interesting to experience growing vegetables in the confined space of a container and also in the ground—on a section of land that seems just about infinite by comparison—to see the ways plants react to these different conditions. 1. Container plants are better protected from pests and wildlife. 2. They’re less prone to disease. Diseases that can run rampant through a community garden or large garden bed are less likely to spread from container to container. While I have had container tomatoes felled by blight, that was an exception. Normally I find that tomatoes, peas, carrots and lettuce often grow more vigorously and with fewer pests in a well-maintained pot. 4. There’s less work. Anyone who’s got a yard or a garden plot will tell you that weeding and mulching makes up the bulk of the work. Those are things you’ll largely avert by keeping your garden small and contained in pots. The best part of keeping a garden small is enjoying the lush growth and creativity while minimizing those moments of overwhelm. By staying in the spirit of starting small and doing it well, stage-by-stage, the workload can be less and the results more satisfying. 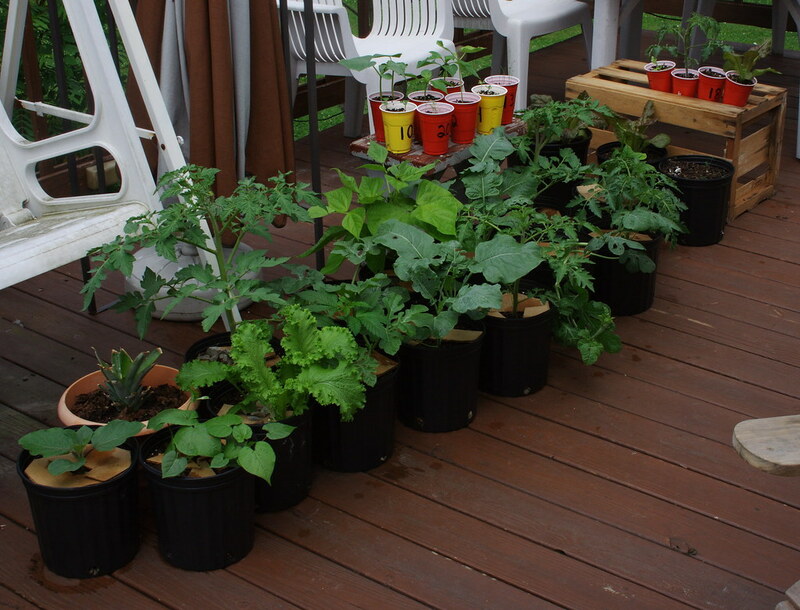 It’s also less expensive to keep the garden small. This year I made a second small vegetable bed in my backyard, and it took only one hour to turn the earth for an approximately 2×8-foot area. I had run out of homemade compost, but I only needed two bags of good topsoil mix to build a sufficient base. The edging I love to use—a low, wattle construction made from the prunings of our monstrous hardy kiwi—is relatively labor intensive, but for such a small area I can accomplish it in a few hours and feel proud of flexing my creativity and handiwork. The grand total cash layout for this new bed was $10.20 (for the topsoil), and I’m expecting it will easily pay for itself in tomatoes. Something I really admire are intensive gardening methods, where the focus is on creating excellent soil full of beneficial organic matter that can support many plants in a small area. In addition to higher harvests, intensive gardening can have the added benefit of reducing weeding, watering and mulching, since an understory of low-growing plants—such as lettuce, radishes and onions—shades the soil, shielding it from drying out in the hot sun and getting overrun by the non-edibles you usually pluck. So think about starting small and planting the vegetables you most enjoy fresh. For me, it’s plants like greens and peas that can be eaten raw and right away, taken straight from the stem to the kitchen. Where are you planting your garden? Tell us in the comments.